On January 27th & 28th, 2018, the 9th Annual Boca Raton Fine Arts Show will be held in Sanborn Square Park on East Boca Raton Road and NE 1st Ave in Downtown Boca Raton. Presented by Hotworks.org, this highly-acclaimed event features the fine art and handmade crafts of more than 130 of the nation’s most creative & talented artists. In an effort to bring artists with both national and international recognition to Boca Raton, and to ensure quality and originality of all displayed art, all exhibits in the show have been carefully selected by art experts and professionals with over 120 years of combined experience in the fine arts. This spectacular event has been voted in the Top 100 Art Fairs in the country 3 years in a row, with artistic works of various mediums on display and available for purchase. From fine paintings and exquisite handmade jewelry to photography and even found-object sculpture, this diverse art festival is sure to have something for everyone within all price ranges. Over $1,500 in Professional Artist Awards will be presented at this event, as well as a Youth Art Competition for children grades 6-12 or ages 9-19 with $250 in prizes. The Youth Art Competition is sponsored by the Institute for Arts & Education Inc. and is designed to encourage and inspire young artists to explore their talents and create original handmade art. Not only will The Boca Raton Fine Art Show provide an abundance of visual and artistic inspiration, but there will also be an assortment of great food from local Boca Raton restaurants available for purchase as well as wonderful local live entertainment. 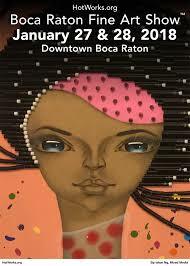 The show will run from 10 am-5 pm both days, and admission is free, so bring your friends, your family, and your appetite and come take part in this amazing community event that brings some of the finest art in the country right here to Boca Raton and encourages art education within our community. We hope to see you there! For additional information, including event location, road closures, event sponsorship, and donations please visit the Downtown Boca Raton Event Website and the Hotworks.org Event Page.